A barrier to moisture is only as good as its weakest link. All paths of moisture through the barrier must be considered. A frequently underestimated weak point of a barrier is the side. Especially on organic electronics, PV or batteries, these side diffusion has a big impact. The picture 1 below shows the degeneration of an OLED by side diffusion. So far measuring the diffusion through the side has been an almost impossible task. Due to the extremely high measuring accuracy and the very large measuring range down to 10-6 g[H2O]m-2d–1 side diffusion can now be measured easily and reproducibly. HiBarSens now even makes it possible to determine the WVTR of adhesives and other intermediate materials in your product. Picture 2 shows the measuring principle for determining the WVTR of an adhesive, as it is used, for example, for gluing glass onto displays or solar cells. 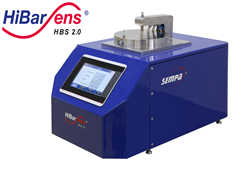 HiBarSens makes it possible to measure the WVTR over very small surfaces. By studying the ultra-barriers more closely, developments can be faster, more cost-effective and more targeted. Due to the continuous technical improvements and adaptation of customer requirements we are the first company who is able to offer WVTR high temperature measurements based on laser spectroscopy. The determination of the WVTR is now more time-saving, detailed and more cost-effective than by comparable chemical methods. More information about hibarsense you will find here.